In 1994, a genocide took place in Rwanda . Over half a million Tutsis were killed by Hutu mobs and militias, with the murders ending only when a Tutsi-dominated rebel army invaded the country and took power. The killers, along with almost a million Hutus, fled next door to Zaire , where soon their refugee camps served as bases for raids into Rwanda . Mobutu's regime backed the Hutus, by late 1996 going so far as to order Zairean Tutus, whose families had lived in the country for decades if not longer, to leave their homes. 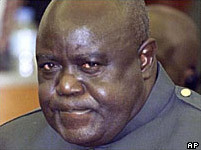 In response, the Rwandan government formed a pact with long-standing opponents of Mobutu (the AFDL, led by Laurent Kabila) and launched attacks against the camps and Zairean armed forces; within a short time, the rebels controlled a swath of land along the country's eastern borders. At this point, it became apparent that Mobutu's army was in no position to resist and so the offensive expanded, with one city after another falling to the AFDL-Rwandan alliance. Mobutu then went to his traditional military backers but for the most part was rebuffed, with this reaction being due in part to U.S. pressure behind the scenes. Officials in Washington were of two minds: they were worried that continued fighting might lead other provinces to secede and, having opposed Kabila in the past, they were unhappy at the thought of his taking power; on the other hand, the U.S. was sympathetic to the Rwandan government and had been trying for several years to get Mobutu to share power. Accordingly, the U.S. tried to push Mobutu to give more power to his prime minister, while also backing various attempts (especially by the South Africans and the UN) to negotiate a Kabila-Mobutu deal to end the fighting. 1) Cohen before Subcommittee on Africa of the Senate Foreign Relations Committee, 6 November 1991, U.S. Department of State Dispatch , 11 November 1991; Burns, quoted in “To Back Reform, Envoy is Named to Zaire,” New York Times , 17 June 1995 (also 22 July 1993, 8 November 1994); Metz (1996: 10-24); Young (1994: 262-3); “Rwandans Led Revolt in Congo”; “U.S. Remains Uncertain on Response in Zaire”; “Talks on Zaire Are Set Up, Then Set Back”; “U.S. Stance on Zaire Draws Foreign Fire”; all Washington Post , 9 July 1997; 8 December 1996; 20 February, 15 March 1997; “France Linked to Defense of Mobutu,” New York Times , 2 May 1997; U.S. Department of State Daily Press Briefings, 3, 4 February; 18, 19 March; 21 April 1997; UN Security Council Resolution 1097, 18 February 1997; White House Daily Briefing, 9 April 1997; “source” quoted in “Mobutu Bows to U.S., Agrees to Negotiate With Rebel Leader,” Washington Post , 30 April 1997 (also 9 April, 29 April); “U.S. Influence Over Zaire Now Appears to Be Limited,” New York Times , 17 May 1997 (also 10 April 1997). There is considerable controversy over the U.S. position on the military actions taken against Mobutu by Rwanda , Uganda , and Angola , the first two of which had military ties with Washington .